How to find ASF documentation and help on ASF modules and functions in Atmel Studio 7. This part of the Atmel ASF ARM tutorial shows how to find documentation and help on using ASF modules in Atmel Studio 7. So far this tutorial series has shown how to use some of the modules available in ASF. In order to use other ASF modules it is necessary to find documentation and examples of the use of these modules in Atmel Studio. 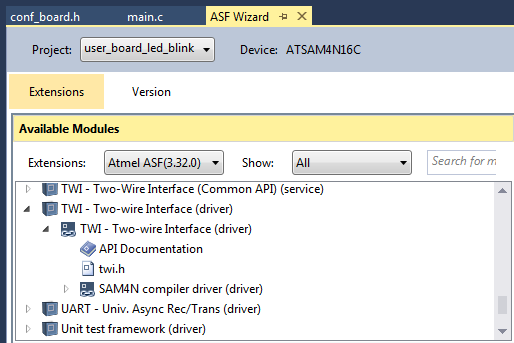 Documentation for a specific ASF module can easily be found and read before adding the module to a project in Atmel Studio. This enables the module to be evaluated to see that it fits the required purpose before adding the module to the project. The documentation can be found in the ASF Wizard by selecting ASF → ASF Wizard from the top menu bar or by using the keyboard shortcut Alt + W.
Available modules in the left pane of the ASF Wizard can be expanded to find their documentation as shown in the image below. Double-clicking API Documentation opens the Atmel Software Framework documentation for the module in the default web browser, e.g. for the TWI module in the above image. Double-clicking the module header file opens the header file for the module in Atmel Studio, e.g. twi.h in the above example. The header file for a module contains data structures and functions prototypes for the module with comments which can help provide information on usage of the module. Once a module has been added to a project, the documentation for the module can no longer be found in the ASF Wizard as shown in the image below. In the above image, the Delay Routines ASF module that was added to the project appears in the ASF Wizard right pane. When the module is expanded, no documentation links can be found. 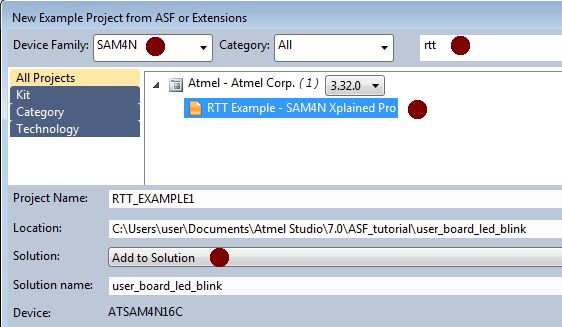 To find documentation for modules already added to the project, select ASF → ASF Explorer from the top menu or use the keyboard shortcut Alt + A. ASF Explorer will appear in the top right pane of Atmel Studio. 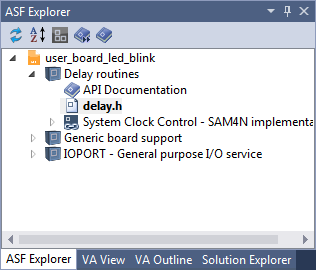 The image below shows ASF Explorer with the Delay Routines ASF Module expanded. ASF documentation can now be accessed the same way as was done in the ASF Wizard. ASF examples that show the usage of various ASF modules can be found by starting a new example project. This is done by selecting File → New → Example Project... from the top menu or using the Ctrl + Shift + E keyboard shortcut. In the new example project dialog box that opens, the device family can be filtered for as well as category and keyword using the top filter boxes in the dialog box as shown in the image below. The image shows that the SAM4N family device was filtered for and that the term "rtt" was used for further filtering. The RTT Example was selected and added to the current solution by selecting Add to Solution near the bottom of the dialog box. When an example project is added to a solution, both the example project and the currently opened project appear in the same solution as shown below. 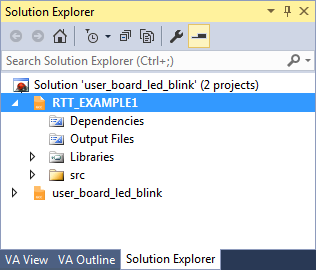 In the above image two projects are open in the same solution, namely RTT_EXAMPLE1 and user_board_led_blink. This allows easy access to the example project so that code can be copied and pasted to the user project as needed without having to open another instance of Atmel Studio. In this way any example project can be added to the solution that a current user project is in. If code on how to use the USART is needed, search for and add a USART example project to the solution. See how the code works and add the necessary code to the user project.